If your Spectacles are running low on battery, you may not be able to pair them to your phone, take new Snaps, or import Snaps you’ve already taken. Take your Spectacles off and double tap the right side to check their battery life. You can also swipe up to Memories in Snapchat to see your Spectacles’ charge level. Charge your Spectacles by plugging the Charging Cable directly to them and a USB power source. This is the only way to charge Spectacles 2 (Nico, Veronica). Spectacles 2 (Original) can also be charged on the go in their included Charging Case. 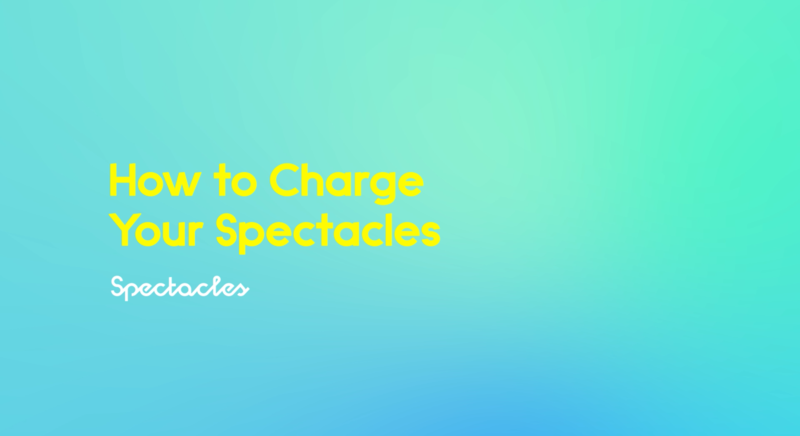 Use the Charging Cable to recharge the Charging Case — or your Spectacles directly. When the Charging Case is fully charged, it can recharge your Spectacles 2 (Original) up to four times. A UL-certified USB wall charger is strongly recommended when charging your Spectacles and the Charging Case. If you’re having issues charging your Spectacles 2 (Original) in their Charging Case, try adjusting them so the magnet connects and they sit in the case properly. You should see the Spectacles LEDs flash once and begin to pulse. If you only see the single LED flash, take the Spectacles out of the case and try folding the left arm first. You should then feel the Spectacles click into place! To check the charge level of your Charging Case, press the button on it. The Case’s LED ring will light up to show you the current charge level. If only one quarter of it is lit up, then you’ll need to recharge your case! Once the battery has reached 100%, your Charging Case will stop charging your Spectacles automatically — so there’s no need to remove them from their case. If your Spectacles have been exposed to water, be sure to thoroughly dry them thoroughly before charging. Trying to charge them while they’re still wet can damage their charging connectors! Make sure the charging ports on your Spectacles are clear from dust or debris. Even if you don’t see any LEDs, leave the Cable connected to Spectacles for at least 20 minutes. It may take some time for your Spectacles’ LEDs to light up. If the Charging Case does not seem to be charging your Spectacles 2 (Original), try connecting the Charging Cable directly to your Spectacles. If they still aren’t charging, try a different power source or wall outlet. If your Spectacles are not showing any signs of charging after 20 minutes, please try a Power Cycle. Note: Please don’t attempt to remove or replace the battery in either your Spectacles or their Charging Case. This could damage the battery, which could lead to overheating, fire, and injury. Since the product was designed for safe removal of batteries at end-of-life by a waste treatment facility, be sure to recycle them separate from your household waste according to your local environmental laws and guidelines.